Herbert Stanley Johnson was born January 31, 1942 in Baltimore, MD to the late William Johnson and Irene Jeffers. On Thursday, September 6, 2018 God called him to enter into his rest after a long illness. Herbert attended Luther H. Foster High School. At an early age he joined the Navy in which he proudly served his country. He returned with many Naval stories and accolades. He held many jobs, the most memorable was Foote’s Tire, and he had multiple hobbies. Lovingly known as “Pa” or “PaPa”, he loved “all” of his children, grandchildren and great grandchildren, there were no steps or halfs, only wholes and they loved him. He was a good husband, father and grandfather. God blessed him with many talents and he operated in them well, always staying humble and kind. He leaves to cherish his memory: a faithful, dedicated and devoted wife Audrey V. Johnson of thirty-seven years. ; seven children Brenda Rowe (Matthew), Cynthia Drew (Walter), Serlena Walker (Carl), Bobby Reynolds Jr. all of Crewe, VA, Herbert S. Johnson Jr., Eziel Johnson and Calamenta Johnson all of California; forty-two grandchildren; thirty-two great grandchildren; two brothers Wilbur Johnson of New Jersey and Tyrone Liggon of South Carolina; one sister-in-law Gloria Mason of Emporia, VA; three brothers-in-law Russell Vaughan (Rose), Larry Vaughan both of Delaware and Frances Vaughan of Germany; two aunts Ester Walker and Estell Eppes of Blackstone, VA; and a host of nieces, nephews, other relatives and friends. Funeral Services Tuesday, September 11, 2018 at 1:00 p.m. at Mt. Calvary Baptist Church, Crewe. Interment Foster Family Cemetery, Crewe. 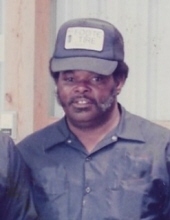 To plant a tree in memory of Herbert S. Johnson, please visit our Tribute Store. "Email Address" would like to share the life celebration of Herbert S. Johnson. Click on the "link" to go to share a favorite memory or leave a condolence message for the family.